While there are many events for entrepreneurs and investors, there are few that focus primarily on the outcomes for attendees. Our mission is to ensure our entrepreneurs and investors gain actionable knowledge, make meaningful connections, and have significant deal-making opportunities. The two-day event will receive 1,500-2,000 Investors, Entrepreneurs, and Vendors, while showcasing over 150 Exhibitors in 50,000+ sqft of exhibitor space. 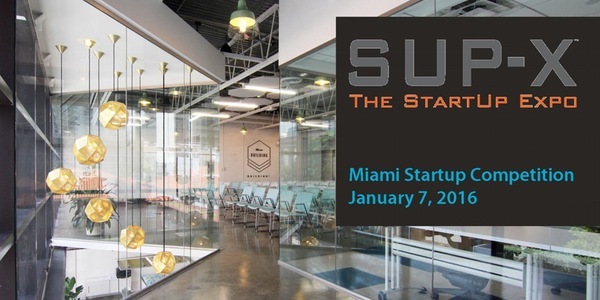 We kickoff SUP-X in Miami @ Building on January 7th in the first of 3 startup competitions in South Florida where winners receive a booth at SUP-X in February, and gain eligibility to be considered for the finals! Use code “LUMINARY” to save $5.00 off the ticket price. Startups Nominated by the Community! One company will be nominated from each our of community partners: Rokk3r Labs, New World Angels, Miami Innovation Fund, Accelerated Growth Partners, the Enterprise Development Corporation of South Florida, Tamiami Angel Funds and more! In addition to the community-nominated startups, one at-large startup may compete as well, as long as you meet the following requirements: less than $3mm in revenues, less than $3mm in capital raised; no restaurant concepts, real estate deals or real estate partnerships or project/infrastructure finance, and must be based in Miami-Dade County. Interested companies should email Bob Fitts. Two startups will be crowned as the winners and will represent Miami-Dade in the SUP-X startup competition semi-finals in February – where they’ll have an opportunity to win part of $50,000 total in cash and prizes! Ticket price includes light food & refreshments. Come have a beer, root on your friends and kick off 2016 with SUP-X! Random drawing for SUP-X tickets, too! Event limited to 150 people. RSVP today! A gathering of major angel groups and funds from throughout the state that specialize in seed to series A investing. This is an excellent opportunity for area entrepreneurs to learn which area angel groups and funds are the right ones for them to pursue for funding. The panelists will provide information about their investment parameters, their process, typical funding size, and contact information. The panels will also discuss pertinent issues related to raising capital and investing that entrepreneurs and investors alike can learn from. Technology and fashion are not fields that have previously been known for their interaction. Until now. Wearables, e-commerce sites, apps and fashion tech are changing both industries at an incredible pace. To celebrate, we’re gathering together renowned wearables and fashion tech experts, the latest technology trends, and the most talented young entrepreneurs in the world’s biggest Wearables & Fashion Tech startup competition in the world! 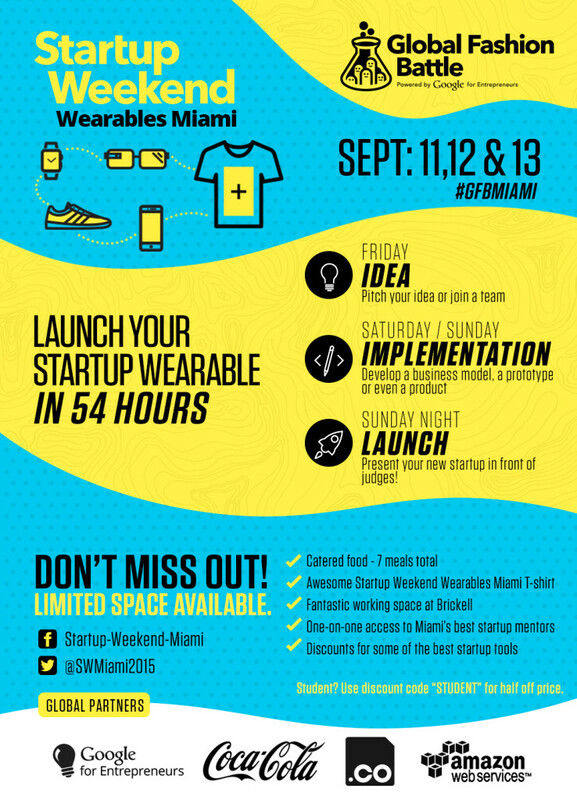 Welcome to STARTUP WEEKEND’S GLOBAL WEARABLES AND FASHION TECH BATTLE! Each of the cities participating will host a Startup Weekend – a 54-hour event bringing together developers, designers and non techs to create functional companies from scratch. Startup Weekend is a global grassroots movement of active and empowered entrepreneurs who are learning the basics of founding startups and launching successful ventures. The Idea Center at Miami Dade College and Tel Aviv University will join forces in linking together two successful startup ecosystems. Learn from one of the top tech and startup ecosystems in the world — Israel. Oren Simanian, founder of StarTAU, the Tel Aviv University Entrepreneurship Center, will discuss best practices in innovation in Israel as well as provide practical, hands-on skills and knowledge used by successful Israeli startups. Oren is the Founder @ StarTAU, Tel Aviv University entrepreneurship center, as a key person in the start-up ecosystem he assists entrepreneurs to take it to the next level. Oren has designed tailor-made programs to support many sectrs to become entrepreneurial. He has one of the strongest track records in the Israeli seed ventures industry.